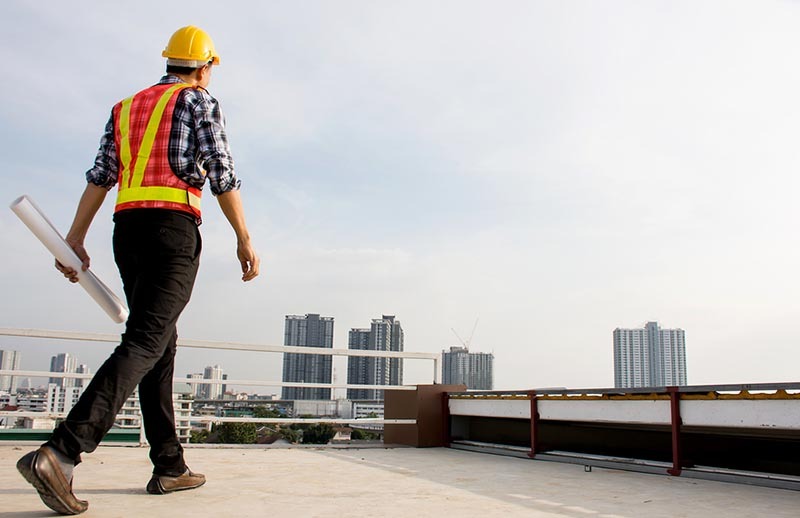 Choosing a safety system for roofs can be a daunting process, especially as you need to think of people’s safety, installation time, how this system affects the roof and, of course, the costs. Don’t put a price on safety – in the end, you risk everything by choosing an unsuitable roof protection method. 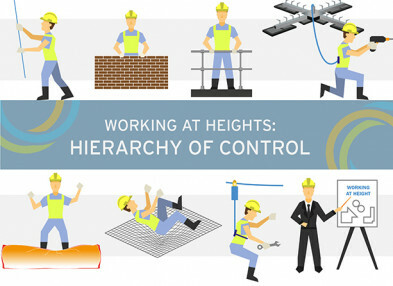 If you’re not sure where to start, why don’t you become familiar with the ‘Working at height hierarchy of control’? The first rule is to try to avoid working at height completely. Of course, this is not always possible, which is why collective protection is the next type of solution that is being suggested. Roof edge protection is a collective safety solution. 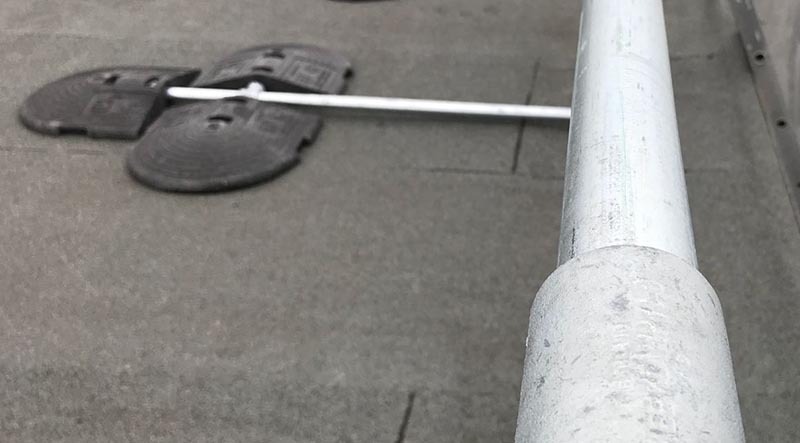 A suitable roof edge system will keep everyone going on your roof safe, whether these are visitors, maintenance teams or employees. A collective system will also remove the human error factor often attributed to the user. This means that the user will not have to worry about wearing a harness or connecting to a personal protection system; all they will have to focus on is the task on hand. Scaffolding is the most common way of protecting your workers from falling, but it shouldn’t be used as a permanent roof edge solution. Bear in mind that not all who access a roof are construction workers – some of them can be maintenance staff or members of the public. 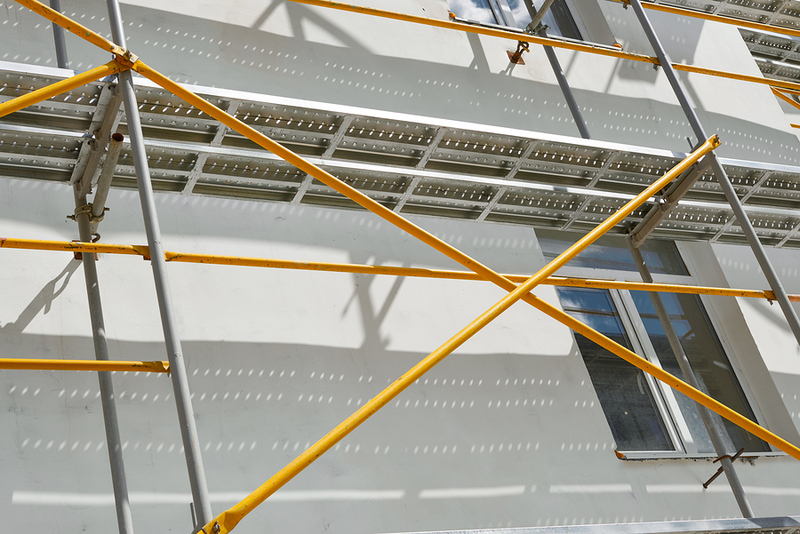 Generally used by construction companies to gain access onto the roof, traditional scaffolding takes a long time to set up and as long to be taken down. What is more, it gives the site an aspect of untidiness as well. A fixed roof handrail has its advantages and disadvantages. 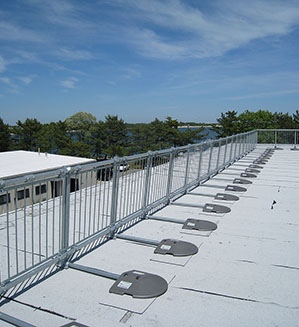 While a lot sturdier than scaffolding, a fixed handrail will pierce your roof membrane or parapet on installation. There are several types of fixed roof edge protection systems, each made of a different material or requiring various installation methods. Again, because they would sit on a roof, these handrails need to be made of an anti-corrosion material. A welded handrail will need special labour to be present on site and would require a lot of time for installation too. Welded points are very likely to become weak in time (if not done properly). Repair or replacement of sections will be time consuming, requiring the entire system to be fiddled with. Welding will also melt the galvanising on steel for example, making the system prone to corrosion. Where possible, choose systems that do not require any fabrication on site. A tube and fittings system, such as Kee Klamp or Kee Lite will help you build a sturdy, easy to install and repair handrail in a very short period of time. Galvanised steel or aluminium are materials that have great corrosion resistance and are perfect for outdoor use. A fixed handrail is usually installed on a parapet (either on top or on the side). This will be easier and safer to install and maintain than a railing fixed on the side of a building. When there is no parapet on the edge of a roof, a solution can be installing the fixed rail onto the side of the roof. This system might cause issues when installing because of the access required to the side of the roof. Free standing roof edge protection does not penetrate the roof membrane, keeping it waterproof and secure. 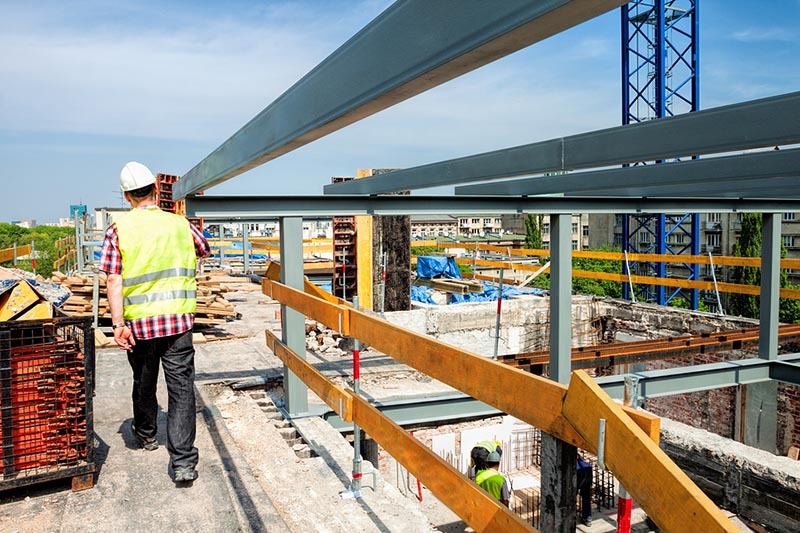 If it does not require fabrication on site (ie welding), the system will also take very little time to install (for example, a 100m KeeGuard system can be installed in a day, by a team of 2 people). As discussed above, we recommend avoiding welding if you can. A roof edge protection system that is free standing and does not require any welding is, in our opinion, the best solution. Easy to install and maintain (and as easy to take down if needed), its modular design means that it will create minimum disruption should it need repairing, or parts removed. KeeGuard for example comes in both galvanised steel and aluminium options, both of these being super resistant to corrosion. 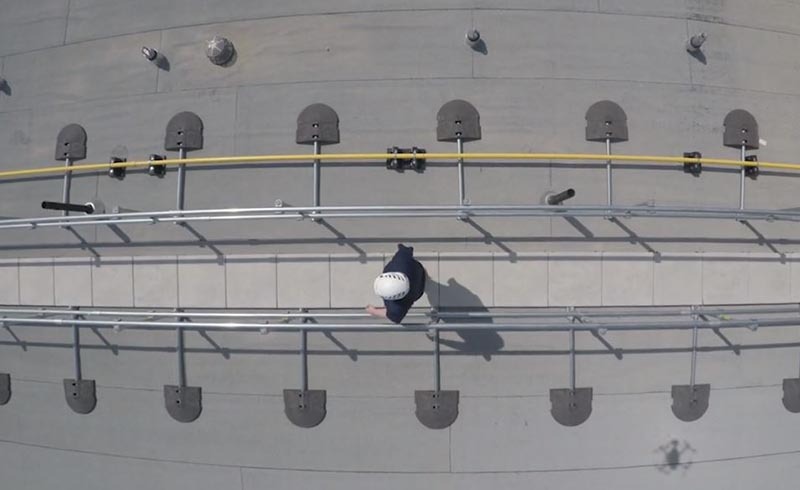 There is a lot to take into consideration when it comes to working at height standards. A non- compliant roof edge solution will put people’s lives in danger and can get your company seriously fined. As a customer, you will need to know, depending on various aspects of your project, what kind of standards your roof edge protection needs to adhere to. If you are unsure, arrange for a risk assessment to be carried out. 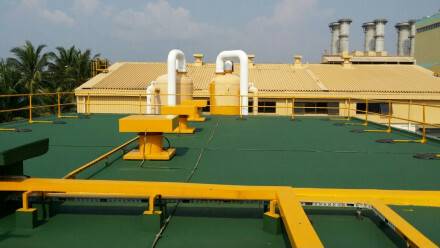 Take into consideration the roof pitch, membrane, performance in both wet and dry weather conditions and whether the system was tested with or without an upstand . You should know what you need the system to do first before figuring out what standards it needs to adhere to. How do I make sure a system is indeed compliant? Some companies will claim that their solution is compliant with existing standards without this being true. Ask for a company’s test reports for their products. The company should be able to provide these and prove compliance with the respective standard. HSE INDG 284 "Working on roofs"
Installation of any system needs to be done in accordance to the manufacturer’s instructions. Not respecting the manufacturer’s guidelines or using the system in other ways than it was intended for could mean that you are putting people’s lives in danger. Make sure that the installation is handled by a competent team. Any safety system needs to be checked periodically and properly maintained. If you spot anything that does not look right, stop using the system immediately. Roof edge protection needs to be able to hold a person’s weight when they lean or fall against it. Materials such as wood will not necessarily be suitable and will put someone’s life at risk. Anti-corrosion coating plays an important role in the wellbeing of a roof edge system. This is why we recommend staying away from systems made of unsuitable materials or products that require welding. A weak area in your roof edge protection system will deem the entire solution unfit for purpose. Unfortunately, welded systems are more prone to rust than any other solutions. Galvanised steel or aluminium offer great resistance towards corrosion. For example, if access to the roof needs to be done via ladders, then a suitable industrial self-closing gate and a ladder cage are required to keep the user safe. 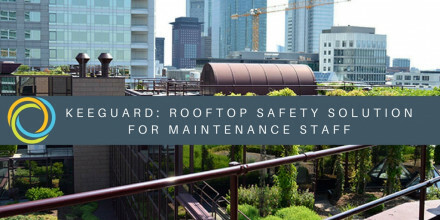 Another example follows a roof that is properly equipped around its edges but does not consider the user’s safety while on other areas: there might be roof hatches or fragile roof areas left unprotected. Before deciding, take into consideration whether your chosen roof edge protection system will cater for your type of roof – flat or sloped, made of felt, asphalt, metal or other materials. For example, most roof edge handrailing systems will not be suitable for use on a sloped roof. A safety system that is not designed to standards is guaranteed to put your life in danger. Also, be aware of companies that claim adherence to various standards when in fact their systems are not suitable. Ask for test reports if unsure. Before having a roof edge protection system installed, think whether these will be difficult to install and what kind of safety measures you need to put in place for the actual installation. You don’t want to keep installers working on a roof for a very long time either – especially in rougher conditions. Choose a system that takes as little time as possible to install, is easy to maintain and repair if necessary. Avoid welding if you can. Is KeeGuard the solution for you?